Mix together all of the chicken marinade ingredients in a small bowl and set aside. Season the chicken with some fresh ground pepper and place in a zip lock bag. Pour the marinade into the bag, turn to coat and refrigerate for at least 2 hours. Preheat oven to 400 degrees. 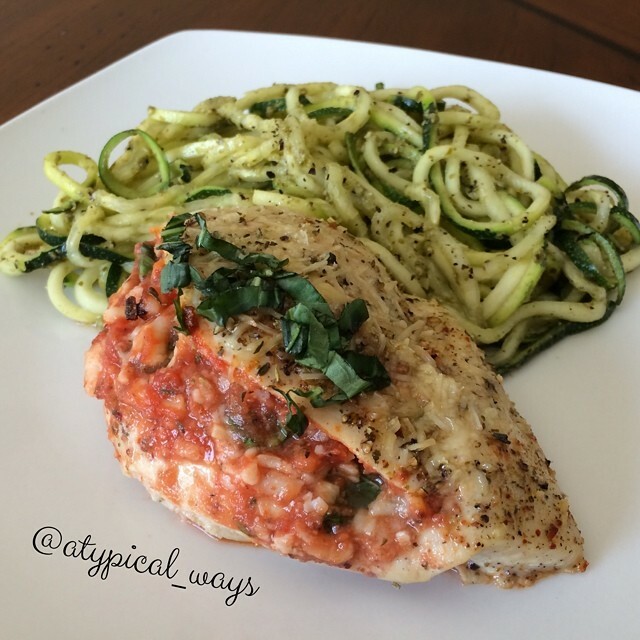 Bake chicken on a foil lined baking sheet for 15-20 minutes depending on breast thickness. While chicken is cooking mix together all of the peanut sauce ingredients. Once chicken is done, allow to slightly cool and then cut into strips. Dip the rice paper in some warm water for about 5-10 seconds and place on a plate. Next layer the chicken with the cabbage & carrots. Carefully roll up the spring roll and cut in half. Egg White BLT – with Turkey Bacon! Preheat broiler to high. Heat Paleo Butter in an oven safe skillet over medium heat with 2 silicone egg rings that have also been lightly greased with the butter. Place the turkey bacon on a piece of foil under the broiler. Crack 2 eggs into each silicone ring in the skillet, top with some fresh ground pepper and cook for about a minute and a half. Next place the skillet under the broiler with the bacon until eggs whites are set. Remove bacon when crispy. Layer egg whites with a few pieces of spinach, 2 slices of tomato and the turkey bacon! 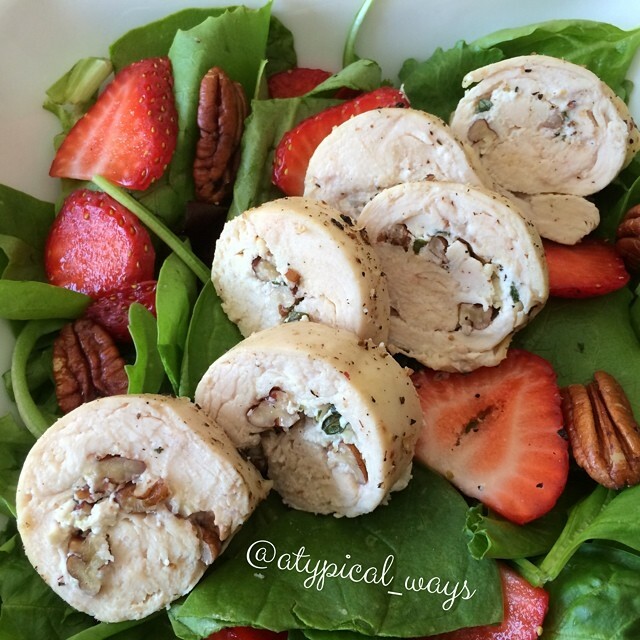 Low Carb Goat Cheese & Pecan stuffed Chicken Breast with strawberry salad – only 310 calories! Preheat oven to 400 degrees. Chop up half of the pecans and place them in a small bowl with the goat cheese, thyme leaves and lemon zest. Put the chicken breast between two layers of plastic wrap, on a chopping board, and use a meat mallet to pound until 1/4-inch thick. Lay the chicken breast flat, season each side with salt and pepper. Spread the cheese-pecan mixture over the breast, covering the entire surface. Carefully roll up the chicken as tightly as possible and secure with either kitchen twine or 2 toothpicks. Place on a foil lined baking sheet, squeeze the lemon juice over chicken roll and then light brush with a little olive oil. Bake for 20 minutes or until chicken is cooked through. Mine was perfectly juicy at 20 minutes. Allow to rest a few minutes prior to slicing. 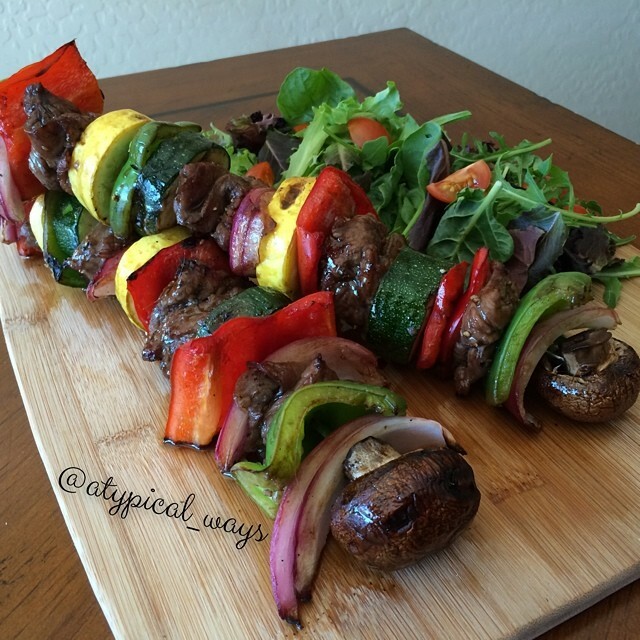 Serve on top of mixed greens with sliced strawberries and remaining pecans! It’s time for another new product spotlight! I’m always searching for that next great thing! So I stumbled across this company on Google while searching for sugar free chocolates. I wanted to have some around the house for when I was having cravings! After clicking around through their website, I decided to give it a shot! It just arrived this morning and it is FABULOUS! The Chocolate truffles are to die for. I was a little skeptical of them shipping to Arizona because of how hot it is right now (108 degrees) but they were packaged really well with cold packs and everything was in perfect condition when it arrived. 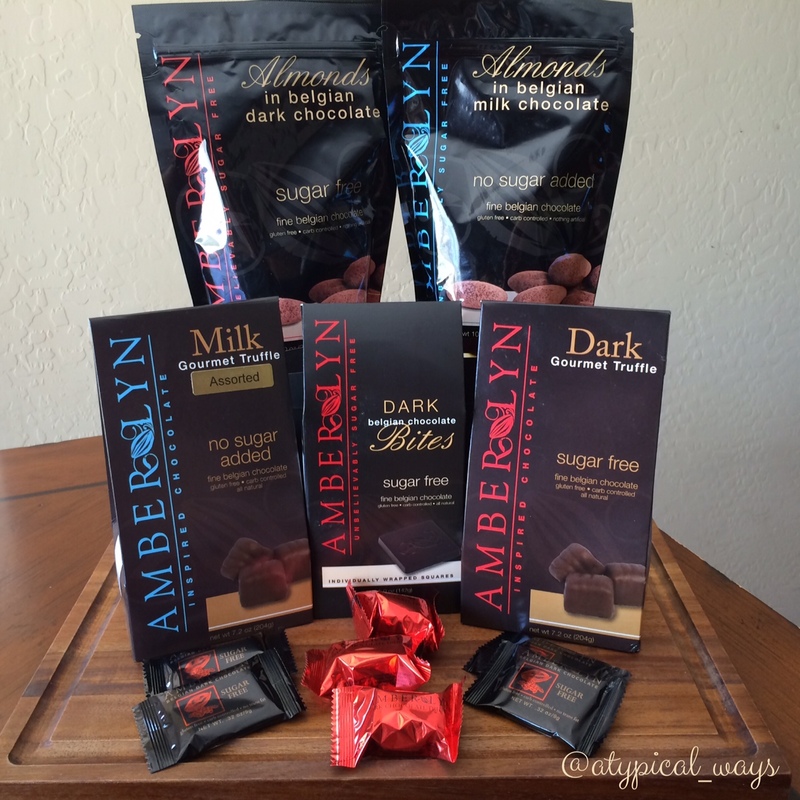 I had originally just planned on getting some chocolates but then I saw the almonds and I had to have those too! I stopped myself before getting their chocolate covered pretzels! They are gluten free, sugar free, low carb & diabetic friendly. The company was started back in 1999 by a retired cop in Utah! If you’ve been following me for a while, you can probably tell that I love small US based companies! Their website claimed that they strive to have the best ‘sugar free’ chocolates in the world and you know what, they probably do, or at least the best that I’ve ever had. I found there to be no strange after taste like others that I have had and they just completely melted in my mouth!